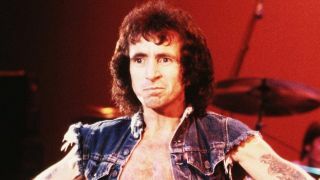 Late AC/DC icon Bon Scott has been recalled as a hard worker with strong ethics by close friend Peter Head. The pair knew each other for five years in the 1970s. They toured Australia as members of separate bands, then worked together in the Mount Lofty Rangers, before Scott became frontman of Malcolm and Angus Young’s outfit. This year marks the 35th anniversary of his death after a drinking session in London. Head remembers how Scott went out of his way to find unusual ways of doing things. “If there was as staircase he wouldn’t walk down the stairs, he’d slide down the bannister. That sense of being a clown stayed with him – it’s one of the main things about AC/DC. The full interview is available to TeamRock+ members. Scott is the cover star of the latest edition of Classic Rock, on sale now in print, digital and via TeamRock+.